It seems like every day is warmer than the last one! If you need to get something done outside, your best bet is to do it before 8 am or after 7:30 pm… even so, I still find myself sweating from the most bizarre places. Did you know you can sweat from your calves? Things are running pretty smoothly at the farm. My goat herd size is easily manageable now. 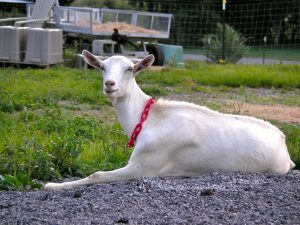 I only kept my favorite goats – Annabelle & kid Pebbles, Sweety & doe Gracie, Molly the Fainting goat, Herman the very little Pygmy wether & Bongo, the Nubian/Boer wether. Of course Frosty the registered Saanen is the queen (although she doesn’t rule… the littlest one, Sweety – she’s the boss! Frosty continues to give me a quart of milk (2 lbs), twice a day. Sometimes a little more but that’s fine with me. I’m still trying to figure out how to use all she’s already giving us! I get a lot of pleasure from milking her. It’s very relaxing and very rewarding. I’m still amazed at this “gift” that comes from her. If things are going smoothly at the barn, she may produce a little more but if things are crazy – like if Sweety is trying to boss her around, she produce a little less milk. I guess her udder is temperamental! She’s so different from the Pygmys.. she’s very calm & gentle. Never acts “starved” like the Pygmys – always comes to her food very nonchalantly – not like, “Finally! Food!” I’m very happy with her. She’s a wonderful addition to the farm. The horses are getting fat off the pasture. They’re all very healthy & playful with each other. However if they see me, they too think, “Yes, food!! !” What is it with critters? Is food all they think about? Summer heat & humidity brought on tons of flies. One afternoon I noticed how many there was… my poor horses were so covered with them it was like their entire faces were black! Because they didn’t like the spray (I had to fight them to put it on), and the roll-on was too expensive, I had to find another solution. Danny at the feed store recommended Python Magnum – these are tags that are attached to cow ears & they repel flies for up to 4 months. I put one on each side of their harnesses & I am extremely pleased with the results. Of course they still have flies but I’d be willing to say the tags eliminate 90% of the flies. The only drawback is that I had to put halters on them – I’ve always been against this practice because anything can happen in the field.. they can get hooked on a fence post, they can hook their rear hoof in the halter while scratching.. any number of things can occur. And of course something did! I noticed last night that Daisy June (miniature donkey), had a sore under her chin – who knows how she hurt herself but the halter rubbing against it made it much worse. She’s penned up now, getting penicillin and ointment & I think she’ll be fine – just needs some meds for a few days along with some TLC & she’ll be okay. I had to pen up Madigan with her – Madigan worked herself up all night because of this separation – poor thing brayed & pranced all evening! However, I think Daisy June enjoyed being away from her… Madigan’s the bully & Daisy June is real mellow & quiet. The 3 llamas Stormy, Major & Big Al are not enjoying the heat either. I’ve set up 2 large fans inside their shelter. We turn them off at night and you can be sure that by 10 am the next morning, all three are laying in front of the fans waiting for them to get turned on. Once the fans are blowing, the llamas stay there until the weather cools down around 4 pm. Big Al will also stand near the garden hose & wait for someone to come around and hose him down! 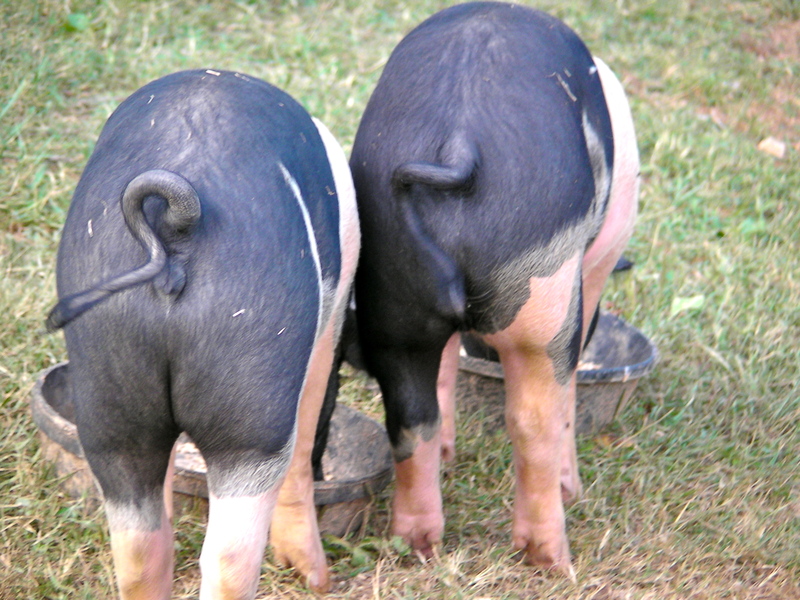 Pork Chop & Bacon are enjoying their life… eating, getting fat, wallowing in the pond – life doesn’t get any better! Enjoy it porkies… come Autumn, you’ll have to live up to your names! My 6 Bantam hens have given me over 100 chicks since Spring – however because they’re free roaming, only about 6 of the 100 have made it to adulthood. Wild animals, hawks, barn rats – all have contributed to the diminishing number of chickens. I finally decided to have a large fenced in chicken coop added to the barn – hopefully that should be up by the end of summer – it would be up sooner but it’s just too darn hot out there to expect anyone to be working outside! Right now I’ve got a hen that’s running around with 12 chicks and another hen sitting on 8 eggs. Hopefully the coop will be built soon enough so we “save” all these cute little guys. Chicks are so adorable – truly you have to watch their interaction to appreciate them. 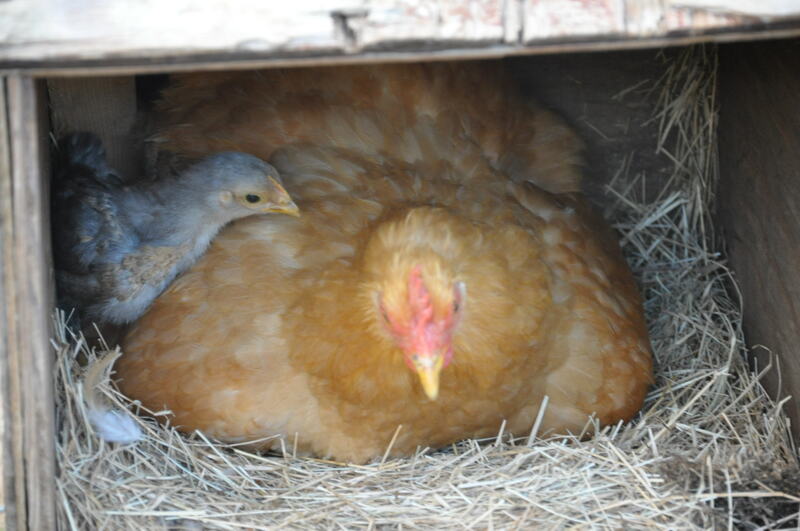 They’re not so cute when they’re chickens but it’s nice to be there for the journey from chicks to chickens. My ducks were prolific this year but not all the ducklings made it. 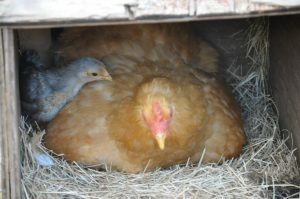 I really felt sad for this hen… for 30 days she sat on that nest & protected those eggs with her life. All the while her sons from last years hatchlings stayed nearby & patiently waited for mom to finish her job. She hatched 9 live ducklings and after keeping them confined for a week they made it to the pond… only to be greeted by a snapping turtle who proceeded to eat (kill) 6 of them before we realized what was going on & set up a trap. Then mom & one duckling got run over. 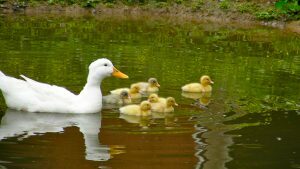 The only ducking that survived was adopted by the other hen who was smart enough to stay out of the pond. 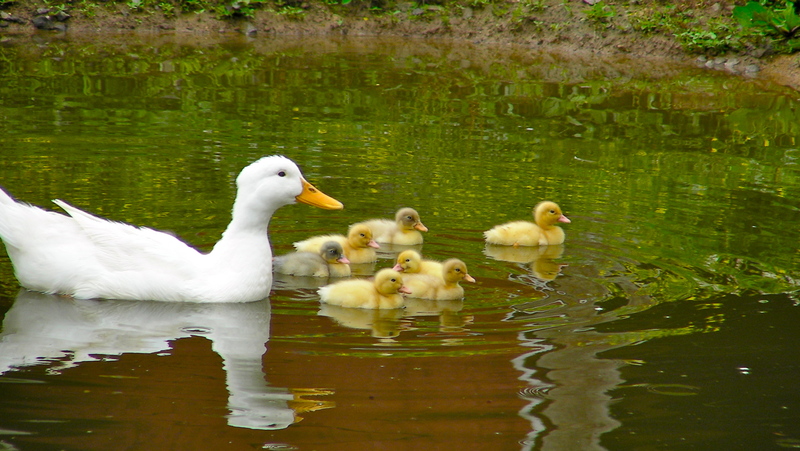 All 7 of her ducklings are still happily paddling in the pond! So it’s been a good summer at the farm. Life is good. Everyone is healthy & happy & it still brings me so much pleasure to interact with them. Being around my critters is therapeutic. It doesn’t matter how much manure or goat poop that I clean – I still enjoy doing this. I’m looking forward to Autumn, when the weather starts to cool down and that I can stay outside longer without sweating so much! It’s nice to be at a point where the number of animals that I have is so manageable. When in a hurry, I can get everyone fed & watered within 30 minutes. Add an extra 5 minutes to medicate Daisy June & that’s all it takes. Of course with fewer animals, there’s a lot less clean up required too! It’s been all good but its even better now! I feel so blessed that I have been able to do everything that I had dreamed about as a child. Life has been good, very good & I thank God everyday for loving me as much as he does. If you want to contact me, please email me at christine@crazygoatlady.com – I might miss your comments if you post them on my site & I hate it when I realize that I have a comment that has not been replied to. This will most likely be my last post until Autumn – May you all have a safe & blessed summer and thank you for being a faithful “fan” of my website. A bientôt chėres amis! I have a litter of puppies due Sept 7th and am looking for a place to buy raw goat’s milk for them. And when you have kids, I’d like to buy two Nigerian Dwarfs from you. I live in Crossville, TN. I subscribed to your RSS feed. No more posts for the summer? Awwwww.